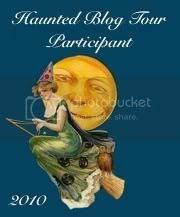 This post is brought to you in part by Mrs. B's Haunted Blog Tour: Welcome, tour-ists! You can find a general introduction to Storytraining below. If you follow this blog and comment on this post, you'll be entered into (or get an additional entry in) my giveaway of a custom-written Looseleaf Handcrafted Story. Best of luck! With Halloween approaching, many of us are creating objects of protection - if nothing else, a jack-o'-lantern. What objects make you or your character(s) feel protected? His old jacket? The key to her house? We can use these to show when a character feels insecure: It's enough for him just to button up one more button on the jacket, or for her to check that the keys are in her pocket, to clue in your audience. Maybe, your character is protecting someone else. Protection is that balancing point between safety and danger, and there's a lot of potential for dramatic conflict there. The guardian might be negligent, leaving her charge in danger (e.g. Sarah in The Labyrinth, who lets her baby brother get stolen by the Goblin King). Or the guardian might be stifling, and her charge ends up yearning for a wider world complete with risks (e.g. Rapunzel in her tower). As a storyteller, you protect your own work. The decision is, what kind of guardian do you choose to be? Are you so eager to share your work that you don't rehearse or revise first? Or, do you lock up your novel in a drawer, and never show it to anyone? I'd argue that we storytellers need to be ready to let our work out into the world, but we need to stay right there fighting for it, from creation to revision to marketing. As Sonja Lanzener put it, "An artist needs to be a warrior. Welcome to the battle." while the artist must be careful & protective of thier entire body of art, i think it is even harder to finally let go. knowing when your story has been finished, is ready for others to see & interpret. i would think it incredibly difficult to hear another praise your story but interpret it so differently that the point is skewed. it amazes me when some authors have let go so completely that they encourage fan-fiction. Great thought-provoking article, Kristen! It's really hard to get the balance between hiding and showing off! Artists definitely need to be warriors,for themselves and other artists! Your blog is very interesting, I'll need to spend some time here. Hopefully, I'll find the time to spend! hopped over from mrs b's blog - what a great give away - how exciting!!! Hi, just stopped by from Mrs. B's. Love the blog! Am now following!